brunch, brunch, brunch ... anyone looking for a brunch place? try kanela breakfast club. 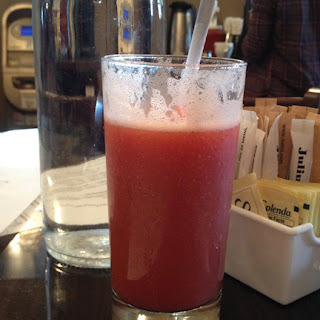 there are two kanela locations ... one in lakeview & one in old town. i met some girlie friends (hi, carly & joelle!) at the old town location a couple of weeks ago for some lovely foodstuffs. per the kanela website : "kanela is a marvelous world bringing a local, organic & flavorful approach to a greek-inflected american breakfast & lunch menu, reflecting our heritage ... a refreshing take on mama's recipes & delivered to you just the same way, with love & a smile." aww. i pretty much drank this in one gulp. so delicious. 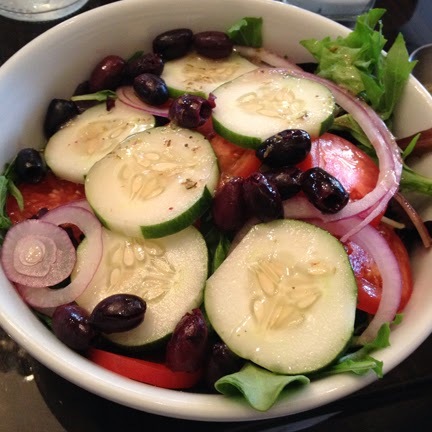 mixed greens, tomatoes, cucumbers, sliced red onions & greek vinaigrette. anyone here familiar w/ the seinfeld episode where elaine wants a "big salad" ... ? now this would have satisfied her greens requirements. literally huge. i couldn't even finish it -- generally not a problem for me + a bowl of basically water. either way, this was comprised of fresh, tasty ingredients. overall = mmm. i've gotta say -- there aren't a ton of vegan options at kanela -- but there are a few ... and there are many, many vegetarian options, so that's good. if you're in the hood, it's worth stopping by.